WE PICK up the Mark Larkham story as our hero, now backed with Mitre 10 dollars, enters the world of ‘wings and slicks’ racing..
To read the first part in this feature, click here. “We won the first race by around 20 seconds. It was really a freak occurrence. Everything just fell into place. So me being me, which I needed a good belting for, I thought…how do we make this RT20 really modern? I was convinced that Skaifey was not going to roll over and take a beating like that. So we felt we had to bring the car 10 years forward. I spoke to Ron Tauranac on the phone who probably hated me for wanting to meddle with his car, but he was very helpful. We built new front wings, new front endplates and redesigned the whole front nose. Our aim was to improve the aerodynamics with more front downforce, but all we did was make a pitch sensitive pig,” Larkham recalls, adding that it was another great lesson learnt – or by ’95, maybe not! 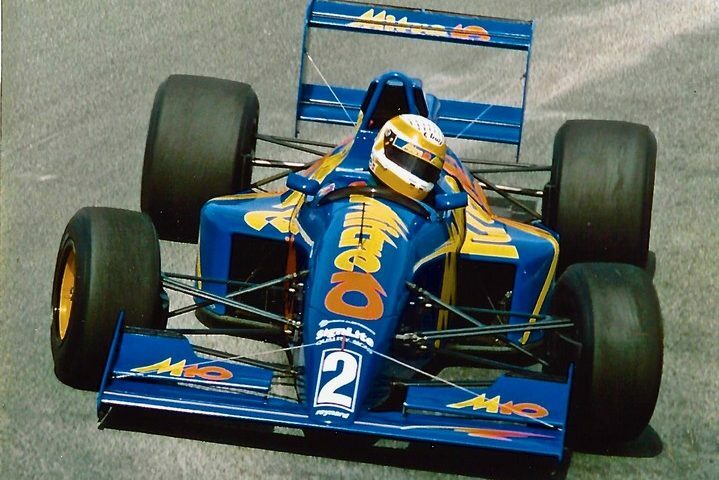 Larkham had a passion for open wheelers and was intent on surrounding himself with great engineers and people who could craft great race cars. Guys like Dave Mawer and Elwyn Bickley were part of the journey with the team under the management of Greg ‘Pee Wee’ Siddle. 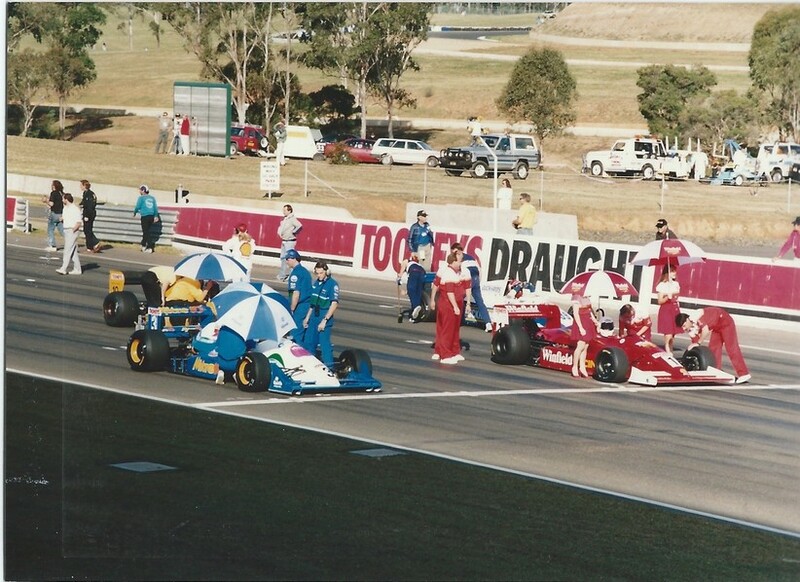 The Van Diemen importer and driver management ‘guru’ had forged a long relationship with Larkham in his Formula Ford days and would provide a guiding hand for many years to come. The Mitre 10 relationship was growing and Mark worked very hard to open the dialogue with a host of their suppliers. 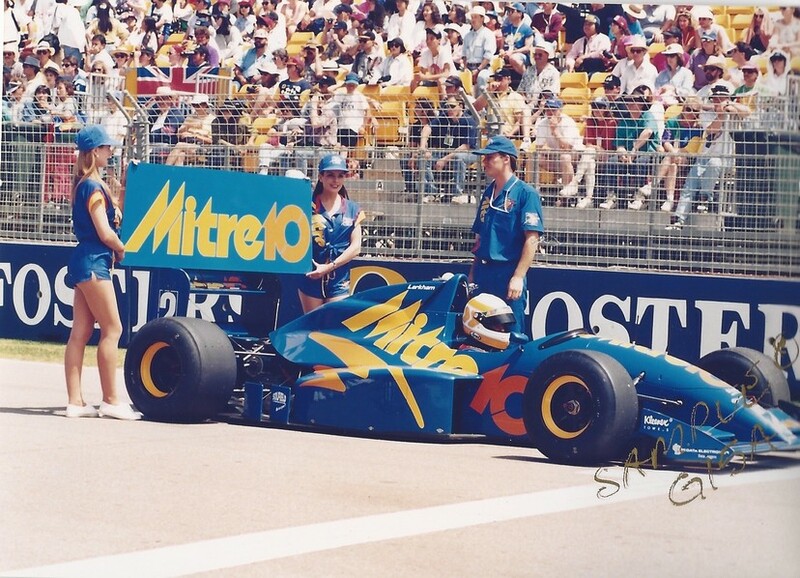 He built a ‘real deal’ show car and the racing program was visible at over 500 stores across Australia. The hardware chain were one of the first companies ever to measure the value of sponsorship and that analysis occurred after every season. A huge motivation to make sure the sponsorship stacked up for the race team – and it did. The company stayed with Larkham for 10 years becoming one of the longest associations of the era. 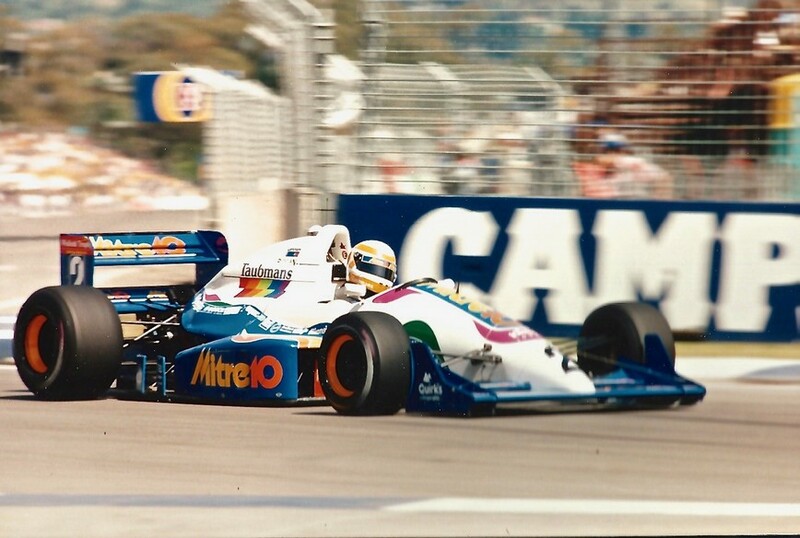 Mark went back to running his own team in Formula Holden in 1993 with a Reynard 91D purchased from Forti Corse in Europe. It was also at this time that Larkham and Siddle convinced renowned engineer Bruce Cary to return to Australia, whom played a key role in the engineering, development and success of this car. Following success in Formula Brabham, began a transition and long association with the Ford brand and a succession of Falcon V8 Supercars. But again, Larkham did not choose an easy path. Having surrounded himself with old school craftsman and engineers including Carey, Mawer and Bickley, Larkham set about adapting these skills from the realms of open wheel racing into Touring Cars. “I was surrounded by these iconic, detailed, magnificent open wheel engineers. I was immersed in their craft. Guys who took time to explain how things worked and why. I dragged these guys into the world of modern Touring Cars. Of course being purists, a racing car to them was something you built, not converted from a road car. “It just seemed so logical at the time. Let’s build a Touring Car to go racing and let’s employ what we all know from open wheelers into the design and build it like a race car!” Larkham recalls. The first Larkham Motor Sport EF Falcon was in hindsight a mistake. Larkham concedes that whilst the engineering group did indeed design and build a very high standard car, full of really clever stuff, Larkham just went too far. 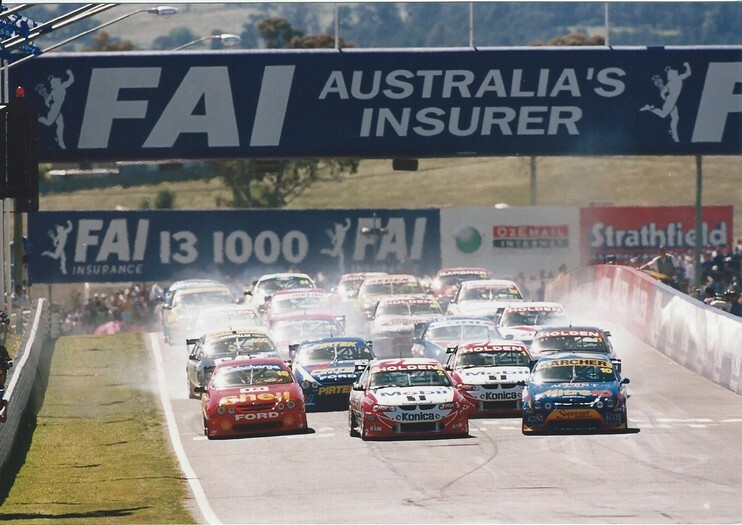 The results reflected this with not a single point scored in the 1995 Australian Touring Car Championship, and a DNF after only 22 laps at Bathurst. 1996 was not much better, with no points in the bank and some soul searching to do. The next move was pivotal for Larkham, as he packed up his Sydney operation and headed to Queensland to house his team in the Stone Bros operation. 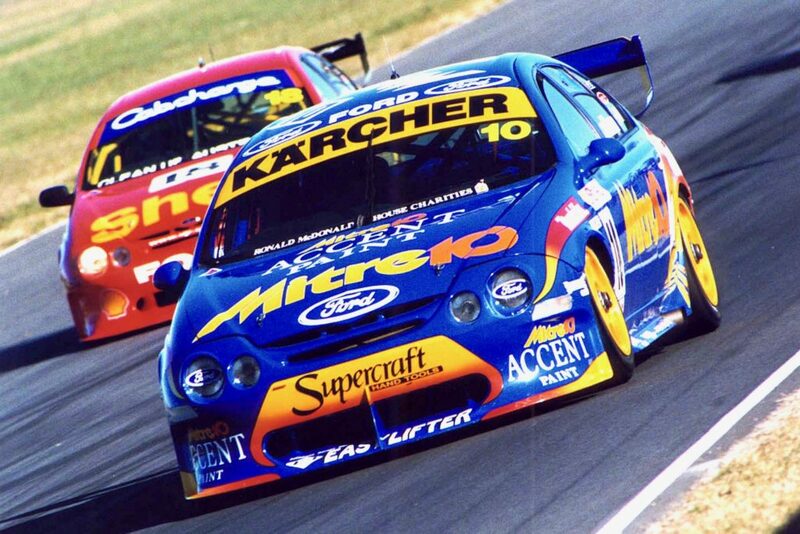 With Alan Jones in the car he owned with Jimmy & Ross Stone, Larkham’s Mitre 10 Ford was effectively now part of a two car team and results started to come. 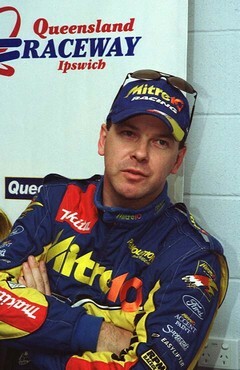 A podium with Andrew Miedecke at Bathurst in 1997, a fourth place the following year and Pole Position in 1999. In 2000, Larkham was back running his own team after the Stone Bros established their own headquarters in Yatala. But the long Mitre 10 association ended that year and with the promise of budgets from new commercial partners not eventuating, Larkham and his team were fighting for survival. “The Mitre 10 decision came right out of left field, unexpected. 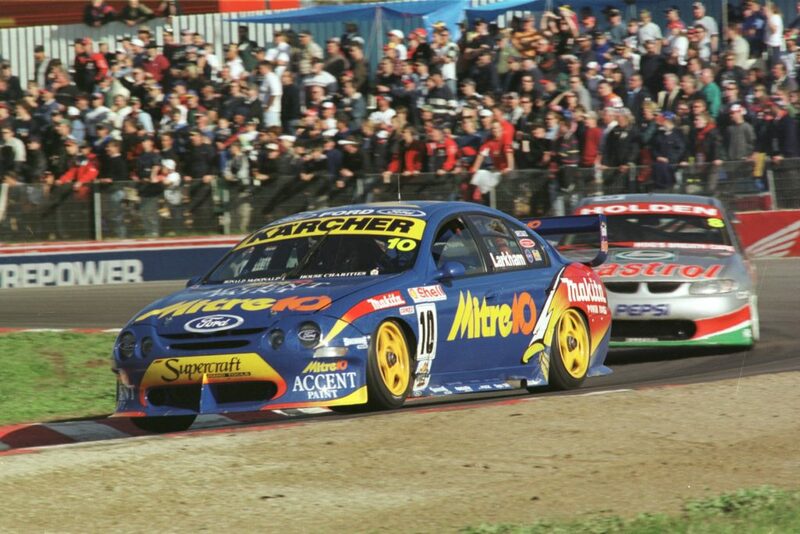 Right at that time we were looking to expand to two cars, I’d even had discussions with a young Marcos Ambrose, among others, about the extended team. I can recall the decision like it was yesterday. It was the 5th December when the new management of Mitre 10 rang me to say they were not continuing. And the reality is, we probably never really recovered from that.” Larkham says. The next period of V8 Supercars was devastating for Larkham. A new sponsor, new livery and high media interest was all looking good to the outside world, however with no funds materializing, Larkham was spending time and money pursuing contractual obligations whilst trying to run the team. Karcher stepped in to fill some of the gap, but it was not until a disgruntled Mitre 10 store owner brokered an introduction to Orrcon Steels’ owner and Larkham’s team began to regain strength. 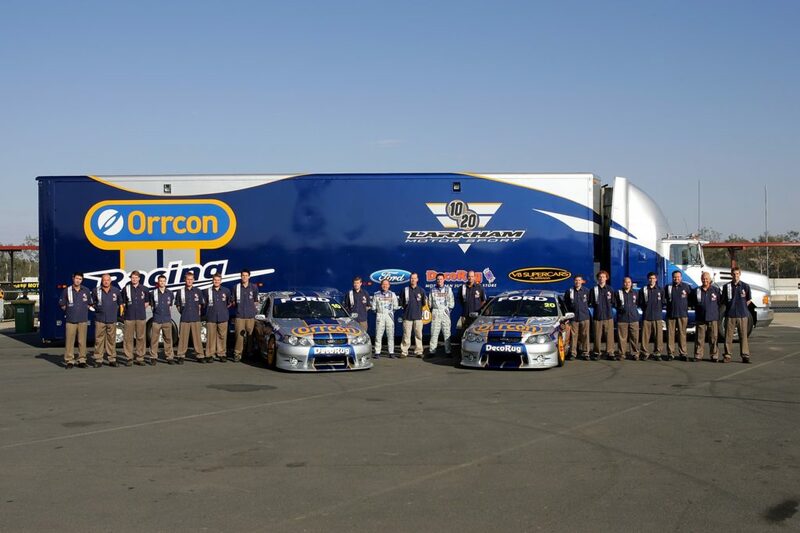 The foundation of this relationship was built on Orrcon’s desire to move purchasing steel from a hard-nosed trade experience into a relationship where customers could go to a racetrack, see the Orccon V8 Supercar team up close and offer a program that was mostly seen as a consumer goods domain. This period also signaled the time where Larkham was finding the dual role of team owner and driver more onerous. It became obvious when Jason Bargwanna joined and Larkham watched how his approach as a pure driver was differing from his own. This led Larkham to thinking retirement from driving was appropriate. Once made, Larkham was then able to bring Mark Winterbottom – who had been groomed by the Stone Brothers – in to take his seat. 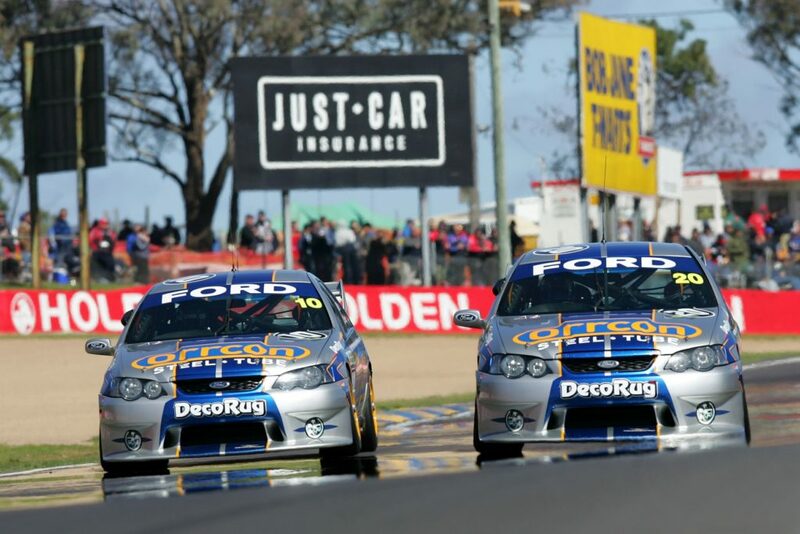 The period of growth in V8 Supercars was making the larger teams more powerful as budgets increased and left teams such as Larkham’s Orrcon outfit once again behind the eight ball. Larkham is at pains to point out, no excuses, but it was just a fact that smaller non works teams were finding it hard to bridge the gap. “We were as good as any team in the pit lane selling the real estate on our car for market value.” Larkham states. Larkham maintains that for many years he pushed the idea at a board level that if a team was selling inventory at true market value, and not carving up discounts, and that was raising perhaps 60% of the required budget to be competitive, then the actual business model is wrong. Hence Larkham was often seen pushing hard on cost containment measures which seemed the logical pathway to him. By 2005, Larkham was coming to the realisation that there was no commercial way to move from an 11th to 15th placed team to competing week in, week out in the Top 5. So, he took a pragmatic position and closed the team, selling his licences back to V8 Supercars who, as part of an improved commercial strategy for teams at this time, were looking to make the ‘pieces of the pie’ larger by reducing the field size. Larkham accepted the opportunity to amalgamate with Craig Gore’s WPS team in 2006, taking the bulk of his staff and drivers a couple of kilometres down the road, with Mark taking on the Team Principal position. The team moved forward in the championship, but by years end it was time for Larkham to look at other ventures. “It had been 20 years at the grinding wheel, and you know, much of it with my best mate to this day by my side Adam Perry – we were ‘best men’ at each others wedding! – so I wanted to have a break from it and see what was on the outside of this all consuming period. Being country born and bred, my wife and I realised a long held ambition of purchasing our modest cattle breeding operation and wanted a bit of a rejig to think about what was next. But what was next was initially of no interest to Larkham. 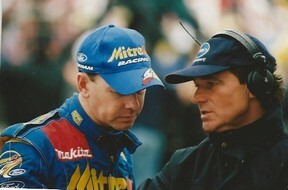 V8 Supercars TV head Murray Lomax had been at Larkham for some time to step into a role in the telecasts he produced. But it was only by circumstance that Larkham was ever given a microphone for his now famous pit reporting. “Murray was at me for a while but I had no interest in the TV thing. It just wasn’t on my radar. But when Grant Denyer broke his back, Murray said now I really need a favour from you. He had flown me down to Symmons Plains before the Winton gig to have a look around the TV compound and how it all worked. In all the years I had been around I had never had a look at the TV side, looked at the truck and the all the production facilities. I went to Winton and helped out and it all seemed to go pretty well. 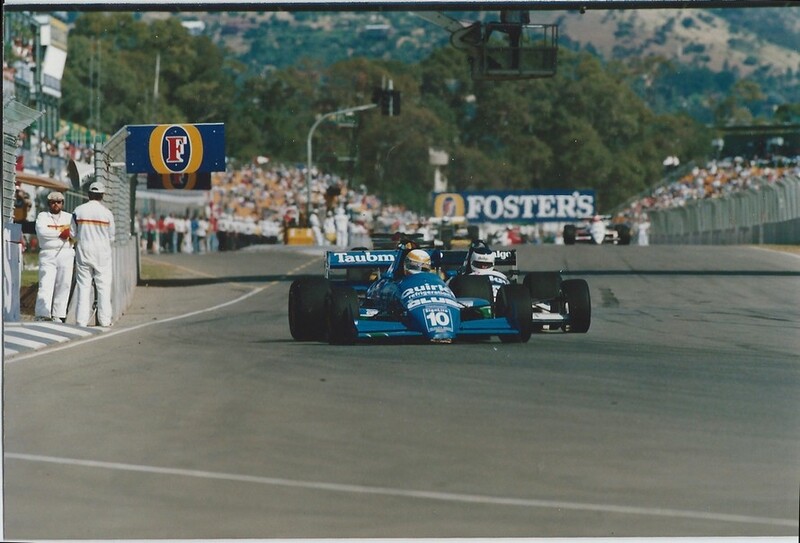 “So then Murray asked ‘can you come to Sandown and help us there…can you come to Bathurst and help us there, can you finish out the year…’ and one thing led to the next. I was in his office one day and trying to explain something about racing to him (Lomax) and he had a white board, so I picked up the Texta and drew what I was talking about on the board… and that is where the penny dropped about the white board.” Larkham recalls. So how does Mark Larkham look at this new found success? “I have been very lucky to have this opportunity and the great people around me like Crompo and Skaifey, I reckon they make me look better than I am, and the TV production team who give me great latitude to just be me. I’m just an ordinary bloke who did not seek a career in the media or television, and that’s the point. I am a racing person not a TV person. So without thinking too hard I just never changed from who I am or made any real attempt to become a scripted and polished media performer – that can be others,” Larkham suggests. 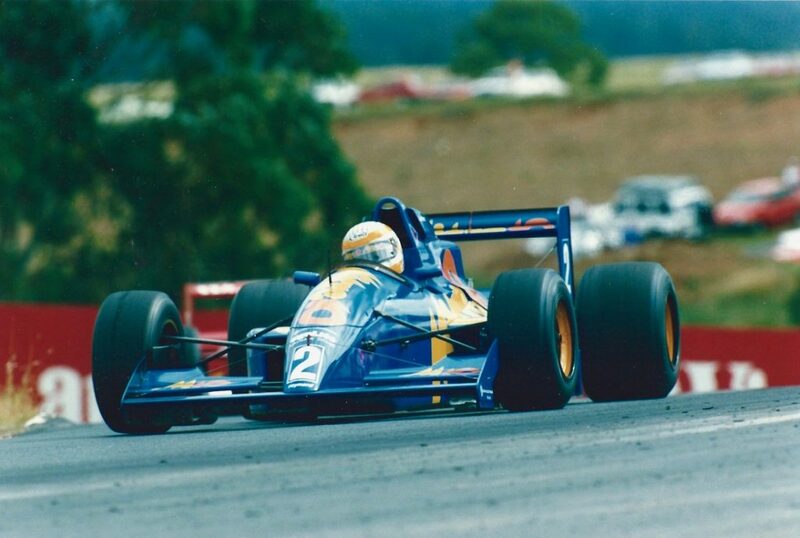 Mark Larkham is one of the Australian Motor Sports great assets. A superbly talented driver, consummate commercial and team manager and now a highlight in the broadcast of Supercars at every round of the Championship. And a great character of the sport.